I want to prance with joy at the feet of those who digitized and complied the Catalogue of Digitized Medieval Manuscripts through UCLA (with the help of an international academe). 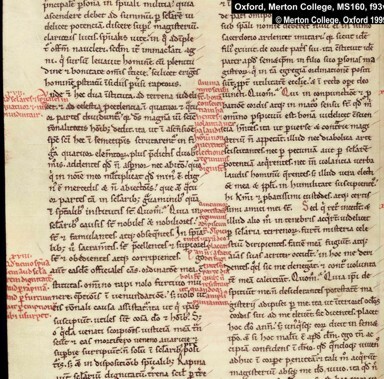 Pages and pages of Medieval manuscripts—complete with holes, ink blotches, dirt, and marginalia—are catalogued and linked to fully digitized books. Here, for example, is a Hildegard of Bingen manuscript page from the book Sciuias siue Visiones ac reuelationes . 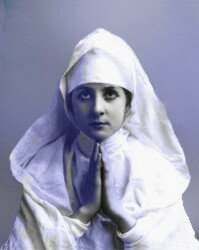 It is a book of dreams, visions, and revelations, written in Latin and digitized courtesy of Merton College in Oxford, England, and complete with a hole in the parchment that the scribe had to work around. Talk about material culture! 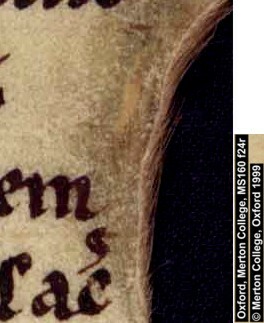 Look how the scribe had to squeeze to write around the edges of the hole, and you can even see the fibers coming through. 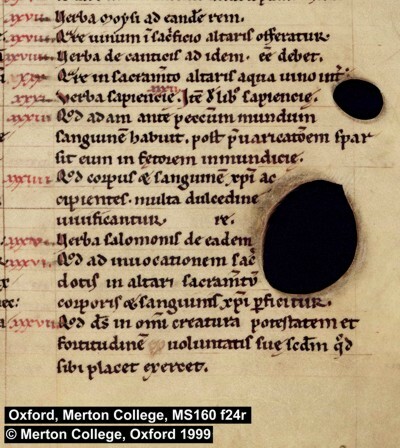 The number of holes in this book and the fact that there are shadow lines coming up from underneath convinces me that these parchment pages were being re-used after have been scraped clean of some earlier text. Here’s another page from the same book, this one shows marginalia. 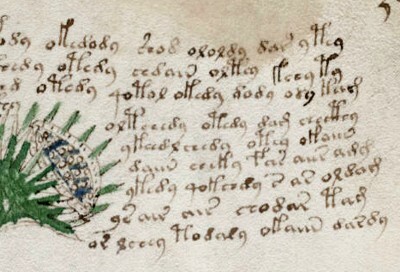 If a scribe forgets something while writing, it is usually to be found in the margin in the same color ink, an extra word or letter or something. This marginalia is in red. 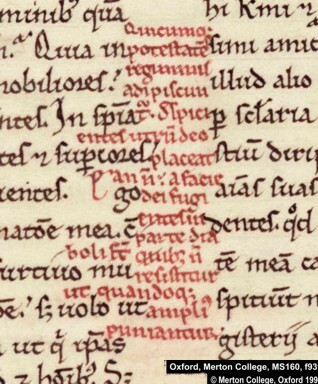 The scribe used red in the manuscript, so he (and likely it was a he, though women copied manuscripts as well) might have come back through the book to write additional comments on the text—or add in bits that he forgot. This marginalia might also be someone else’s commentary on the text, maybe a tonsured Prior looking over the scribe’s shoulder as he was writing it out. This is so awesome, I can smell the tallow. All I need now is a little ink on my fingers.